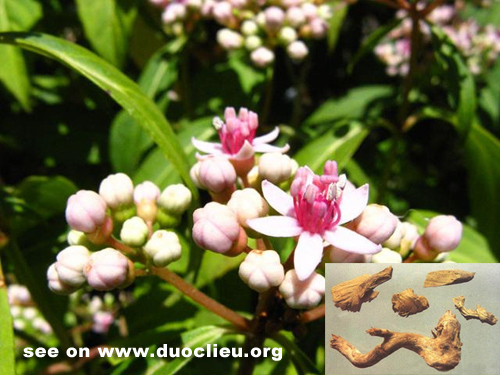 Dichroa root (Changshan)-Dichroa fibrifuga Lour. Botanical Name: Dichroa fibrifuga Lour. Part Used & Method for Pharmaceutical Preparations: The roots are dug in autumn. After the fibrous roots have been removed, the roots are dried in the sun and cut into slices. They can also be fried with wine. Meridians: Lung, heart and liver. Functions: To expel phlegm and relieve malaria. Indications & Combinations: Malaria. Dichroa root (Changshan) is used with Tsaoko (Caoguo), Anemarrhena rhizome (Zhimu) and Areca seed (Binglang). Cautions & Contraindications: This herb may cause vomiting and nausea; it should be used with caution, especially with weak patients.